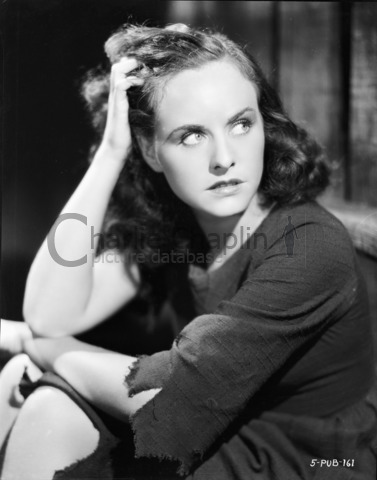 Among Chaplin’s leading ladies, Paulette Goddard stands out for a number of reasons. She was the female lead in his last silent film (Modern Times 1936) and in his first talkie (The Great Dictator 1940). She enjoyed a success beyond and independent of Chaplin, right up in to the 1970s, with the TV film, The Snoop Sisters (1972) - she made forty-seven films in all. She was something of a match for Chaplin - strong willed, independent, a lover of life - her very personality an influence itself on the characters Charlie wrote for her in her two Chaplin films. She was born on June 3rd in 1911 as Marion Levy in Whitestone, New York - though her mother called her Pauline from a young age. This soon became Paulette, and the name Goddard came from her wealthy uncle, Charlie Goddard, who was something of an influence on her, mainly thanks to the lavish parties he threw at which a number of the stars of the day would turn up - inspiring the young Paulette to think of a future as a star herself. Chaplin had been invited for a weekend cruise aboard Joe Schenck’s yacht - Schenck was the then president and chairman of United Artists, the company Chaplin had helped to found along with Doug Fairbanks, Mary Pickford and D.W Griffith. Paulette, another guest, was considering investing $50,000 of her alimony payment in a dubious movie company and asked Chaplin’s advice. Not only did he persuade her to forget this dodgy deal, but also to revert her hair color to its natural brunette - Paulette had become a Hollywood platinum blonde, possibly in a bid to win her more parts from studios. Obviously taking more than a shine to this pretty and charismatic actress, he bought out her Roach contract and signed her up for himself. The fruit of their professional relationship was the film Modern Times, whilst their personal relationship became the material of Hollywood gossip columns. 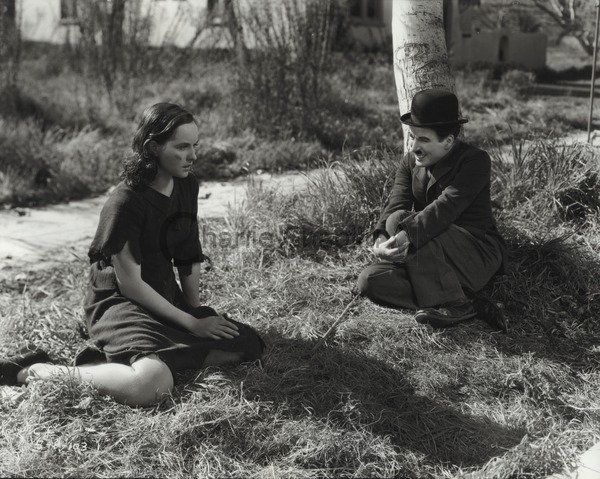 This bore other consequences too - on the positive side Chaplin’s sons, Charlie Jr. and Sydney, looked up to her as a big sister and loved to play with her and have her around. The flip side of the coin was that Chaplin’s dedicated chauffeur and private secretary, Toraichi Kono, felt usurped by Paulette’s new found place in the Chaplin home, and resigned (though not before Chaplin gave him and his wife $1000 each and secured a job for him at United Artists Japan). Paulette and Charlie went everywhere together and Charlie even bought a yacht so they could spend Sundays cruising out to Catalina. Modern Times saw a brilliant team up for Paulette and Charlie - he as the Tramp, and her as the Gamine, surviving by her wit and courage on the waterfront, stealing bananas and handing them out to her fellow urchins. You can see Paulette as many things in this film - a female version of Charlie himself, a loner at odds with the world, making her own rules dictated by circumstance, or, on the same track, the Kid grown up - a female version of course - though this leads again to the Charlie-girl. Perhaps the main difference between them in the film is the way in which their characters defy authority - Charlie with an air of innocence, whilst Paulette certainly does so with intent and purpose. 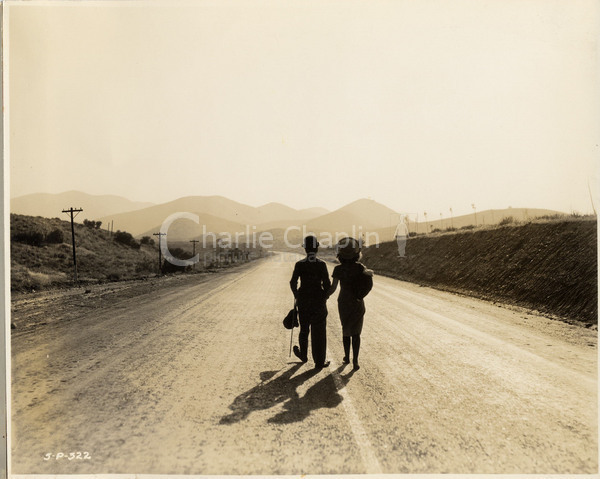 Paulette was pretty much an equal in Modern Times and the ending, the two outsiders against The World silhouetted as they walk off bravely in to their future (and a sunset) gave a new twist to the quintessential Chaplin ending - this time, for the last time, not alone. 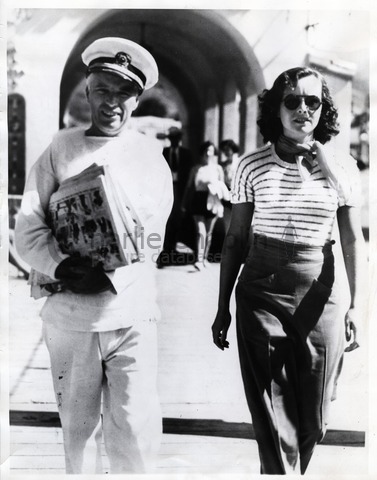 When the film had been completed and premiered (at Grauman’s Chinese Theatre on February 12th 1936) Chaplin and Paulette went for a trip round the Pacific Rim - taking in Hawaii and Singapore along the way. The major event of this trip was that they were at last married, though neither of them would confirm this to reporters upon their return to California. But it was not all plain sailing. There is little doubt that Charlie and Paulette were very good for each other for a time - and that time was somewhat longer and happier than Charlie’s involvement with either of his two previous wives. While Paulette was said to have had a brief fling with George Gershwin during her time with Chaplin, in the end she may have just been too ambitious and independent to stay at Charlie’s careful, creative pace, and they eventually began to drift apart. Generally, they remained on good terms, however, and by the time Chaplin was ready to make his next film (The Great Dictator) Paulette was to be his leading lady once again. There were a few other films before this one for Paulette. They included yet another Laurel and Hardy feature, The Bohemian Girl (1936), two highly thought of films in 1939 - The Women (with Joan Crawford) and the Cat and the Canary (with Bob Hope), and also Second Chorus in 1940 with Fred Astaire. In 1938 she was a serious contender for the part of Scarlett O’Hara in Gone with the Wind (it eventually went to Vivien Leigh). By 1940 however, she was well on her to becoming a major Hollywood star and had a ten year contract with Paramount Studios. Not long after (The Great Dictator, Charlie and Paulette made their estrangement official by way of divorce. 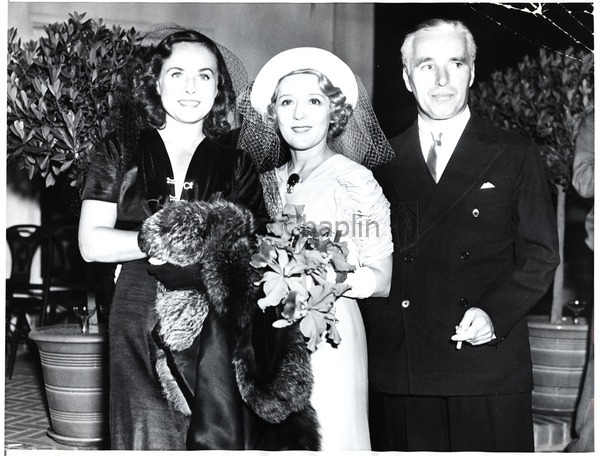 Paulette received another alimony payment and the yacht that Chaplin had bought during their courtship (part of the settlement was also to include one more film directed by Chaplin for Paulette - this never happened). But the 1940s saw her career just get better and better as she appeared in a huge number of films. These included Nothing but the Truth, Hold Back the Dawn, The Lady Has Plans, The Forest Rangers, Standing Room Only, I Love a Soldier, Kitty, Diary of a Chambermaid, Variety Girl, Unconquered, Ideal Husband, The Torch and Bride of Vengeance. For So Proudly We Hail! she was nominated for Best Supporting Actress (won that year by Katina Paxinou in For Whom the Bell Tolls). 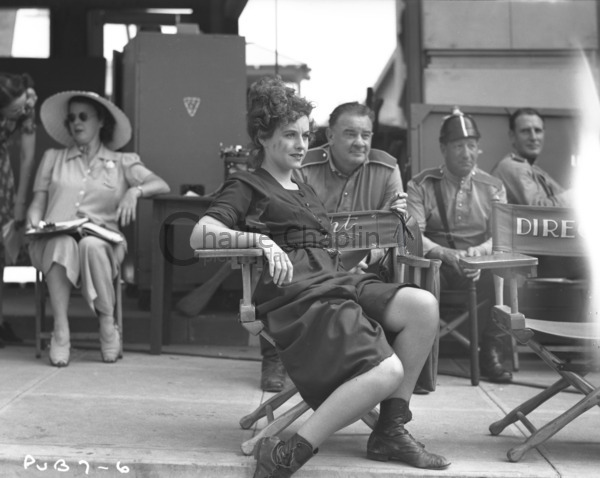 It has been said that Paulette quarreled with director Cecil B. DeMille on the set of Unconquered which in turn led to a lower volume in her career and a relegation to the B-Movies of the industry for most of the 50’s - including Babes in Bagdad, Paris Model and Vice Squad. 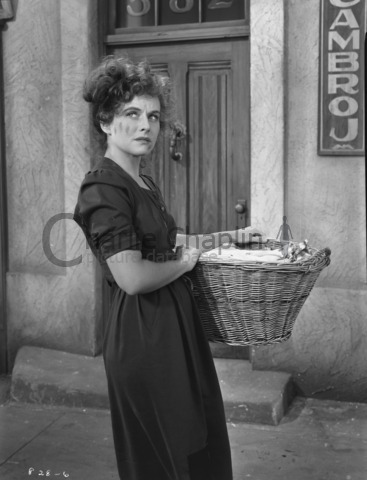 Her last film for the silver screen was in 1964 - Time of Indifference (or Gli Indifferenti). Her personal life was no less lively than her screen career. In 1944 she married actor Burgess Meredith. They divorced in 1950 and eight years later she married the German novelist Erich Maria Remarque, author of the classic All Quiet on the Western Front. Another novelist and a close friend of Paulette’s, Anita Loos, claimed that Paulette was the inspiration for her heroine in Gentlemen Prefer Blondes - Loos would later say “Gentlemen prefer blondes, until they get a load of Paulette!”.